India is a growing market, with huge potential still untapped. Consumers are becoming increasingly savvy about their desired combination of brand, fashion, quality and price. To serve this brand and price conscious customer segment, retailers must pay attention to the outlet stores. Factory outlet offers branded goods at a reasonable price, ranging from 30 to 70 per cent lesser than the normal retail price. It helps the customers to experience the brand who may otherwise not have done so. The format is profitable because of low rent and operating cost, limited services and elimination of the middlemen from the distribution chain. “Factory outlets allow us to spread our reach beyond the established shopping malls. Over and above the increase in our sales, these stores have widened our customer base, and generated more brand loyalty,” says Harkirat Singh, MD, Woodland. “A factory outlet is generally around 2,000 sq ft in size and costs around 2,500 per sq ft to set up,” Singh adds. He believes that there cannot be an ideal ratio of factory outlets compared to the total number of stores of a brand. It should be linked to the brand’s recall value instead. “Also, as a business proposition, it depends on the quantity of non-moving stock a brand is carrying,” Dr. Panwar states. The right location for a factory store is in an area where there is little penetration from branded outlets – close to the city outskirts or along the highways. The customers at a factory outlet are looking for their preferred brands at an affordable price – they are brand loyal but frugal. As customers become more inspirational in their tastes, they seek more value at factory outlets. Year-round discounted merchandise is a great draw for shoppers who want trendy and branded products but can’t purchase them at the regular prices. In case of retail stores, one has to consider several factors for the design and display such as space available and stock in-hand. In addition, the stores must blend well with the other retail stores in the location. However, in a standalone factory outlet, retailers have a lot more freedom for design and visual merchandising. 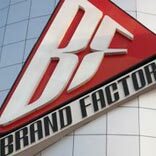 “The objective of store design and visual merchandising is to highlight the brand, the value proposition and the imagery – keeping in line with brand DNA,” shares the representatives of Brand Factory. The branded apparel market is expected to grow at a rate of 30 per cent per annum. Therefore, there will be a proportionate growth in the outlet business as well since both are interlinked, believe industry experts.